Executive Chef Manfred Roth and Chef de Cuisine Michael Wehrle of the Victoria-Jungfrau Grand Hotel and Spa make time to share recipes and an interview. 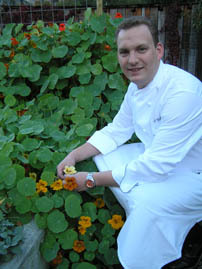 Chef de Cuisine Michael Wehrle has come full-circle at La Terrasse at the Victoria-Jungfrau Grand Hotel & Spa in Interlaken, Switzerland. After completing his apprenticeship in Germany, this inspired chef from the Black Forest of Germany, had his first culinary job in 1997 at La Terrasse at the Victoria-Jungfrau Grand Hotel & Spa, where he worked for 1 year. From Interlaken, his culinary journey took him to Freiberg, Germany, to the Intercontinental in Hyde Park in London, back to Germany, and to Alsace, France before he returned to La Terrasse as first Chef de Cuisine in January 2004. Chef Wehrle likes classic cooking but modernized to today's palate, and to take old recipes and present them in new ways. He likes Spa cuisine, and using fewer carbohydrates, and he believes it is important to cook with good and fresh ingredients, and to present fish in its natural shape and not to cut it into shapes or squares. He has an added advantage when it comes to fresh herbs, as the hotel has their own garden where they grow a plethora of herbs and some vegetables that are used in the three restaurants. As for culinary trends in Switzerland, he feels that chefs are returning to simple but tasteful food. 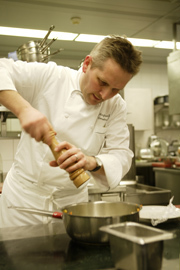 Interested guests can take cooking classes at the hotel with Chef Wehrle in the spring and the fall. There are three menus at La Terrasse, a French restaurant with lighter and newer cuisine: Spa Cuisine, Classic, and a la carte. Chef Wehrle changes the Spa Cuisine menu daily, the a la carte menu every 2-3 days, and the Classic menu changes seasonally. Chef Wehrle is a dedicated chef who cooks at home, cooks when he visits his parents, and even cooks on his holidays. He even cooked on a recent 10-day trip to Bangkok and Hong Kong. He gets his inspiration from visiting markets and seeing new products, reading magazines, and traveling. When not cooking, he enjoys playing tennis and going for walks with his girlfriend. Award-winning Chef Manfred Roth's career has taken him around the globe, where he spent many years working at prestigious locations throughout Asia before returning to his native Switzerland to work at the Victoria-Jungfrau Grand Hotel & Spa. Despite his demanding schedule as Executive Chef of the Victoria-Jungfrau Grand Hotel & Spa's three restaurants: La Terrasse (16 GaultMillau points), Jungfrau-Brasserie (15 GaultMillau points), and La Pastateca, he somehow found the time to write a cookbook, "Küche der Emotionen" (Cooking with Emotion) featuring recipes from all three of the restaurants. He graciously shares a sampling from the cookbook with his recipes for Avocado Soup with Grapefruit Rillette and Basil "Sago," Monkfish Brasato in Pommery Potato Purée, and Simmental Knuckle of Veal, Braised on Roasted Potato Salad with Herb Froth. As they say in Swiss-German, "En gueta" (Bon Appetit!). Avocado Soup with Grapefruit Rillette and Basil "Sago"
Peel the grapefruit, separate into segments and remove the skins. Reserve the grapefruit juices. Mix all of the grapefruit segments ingredients to create a marinade for the grapefruit segments. Set the grapefruit segments aside and let marinate at room temperature. For the basil "sago," soak the basil seeds in iced water until they swell up. Before using them, strain through a sieve. For the soup, peel the avocado and blend with the soup ingredients to a smooth consistency. Serve the soup in a deep bowl, place the marinated grapefruit segments in the center of the soup and sprinkle with the soaked basil seeds. Add a tablespoon of yogurt to each bowl. Garnish with the basil leaves. Firm-fleshed monkfish is ideal to marinate with a full-flavored red-wine sauce and Pommery potato Purée; this is a dish inspired from Burgundy. Finely dice the vegetables and add to the red wine with the herbs. Marinate the monkfish fillets in this mixture for one day, mixing and turning once or twice to ensure the fish is marinated evenly. The next day, remove the fish from the marinade and pat dry with a kitchen towel. Season the fillets with salt and pepper and sear in hot groundnut oil to give the fillets a good crust. Remove the fish from the pan. Add the marinade to the same pan and bring to a boil, stirring continuously. As soon as the marinade becomes clear, remove from the heat, let stand for about 10 minutes and then strain through a cloth. Add the brown sauce to the marinade and reheat to the boiling point. Add the fish and bake in the oven for 15 minutes at 200° C (400° F). Take the fish out of the oven and keep warm. Reduce the sauce to the desired consistency and stir in the butter. Mix the Pommery mustard into the potato purée. Arrange the potato purée in a circle on the plate and spoon the sauce over it. Cut the fillet in half and arrange on the potato purée. Garnish with bacon, focaccia croutons, and chopped parsley. The flavor and tenderness of the knuckle justifies the lengthy cooking time. Roasted potato salad with vinaigrette and herb froth round out this simple dish. Season the knuckle of veal and fry lightly on each side in hot oil. Remove from the pan. In the same pan, sauté the carrot, onion, and garlic slowly for about 5 minutes until golden brown. Add tomato purée and cook for another 2 minutes. Deglaze with white wine, add the herbs, and boil down to a syrup. Add the knuckle of veal and the veal stock, cover, and braise in the oven for 2 - 2½ hours at 160 - 170° C (320 -340° F) until tender; basting often with the stock. Half the onions lengthwise and make 5 cuts in each half. Place on a tray lined with baking parchment paper. Drizzle with olive oil, sprinkle with salt, sugar, and thyme leaves. Caramelize in the oven at 80° C (175° F) for about 1½ hours. Potato Salad: Wash the potatoes and cooked in salted boiling water until three-quarters soft. Drain and cut in half. Mix the parsley with the olive oil and balsamic vinegar. When the knuckle of veal is tender, remove from the braising stock and loosen the meat from the bone. Strain the resulting sauce through a fine sieve, bring to a boil again, remove the fat and thicken to the required consistency with the cornflower and white wine mixture. Season with a little salt and pepper. Place the meat in the finished sauce and reheat briefly. Fry the potatoes in the clarified butter over medium heat until golden brown. Lastly, add the diced vegetables and herbs, sauté briefly, mix in a bowl with the parsley dressing, and season to taste. Arrange a caramelized onion piece and roasted potato salad in the center of the plate. Add the meat, drizzle with sauce and sprinkle generously with chopped garden herbs. Squeeze the herb froth into the marrowbone and put on the plate. Serve at once. Read other articles on the Victoria-Jungfrau Grand Hotel & Spa in the Destinations, Hotels and Resorts, Restaurants, Adventures, Chefs' Recipes and Spas sections. The VICTORIA-JUNGFRAU Grand Hotel & Spa is part of the VICTORIA-JUNGFRAU Collection, www.Vctoria-Jungfrau-Collection.ch.